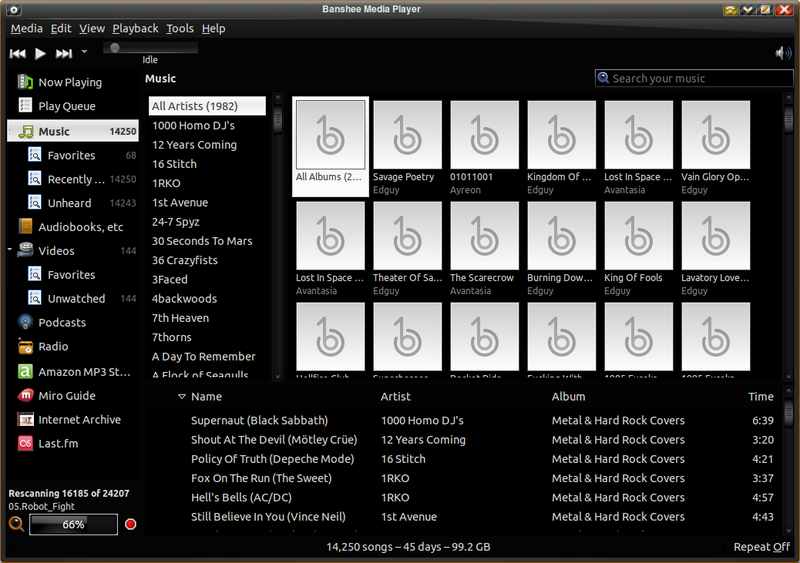 Up until Rhythmbox version 2.96 (the current version in Ubuntu 13.04 is 2.98), the bottom section of the left-hand pane where your devices and playlists are was reserved for the current album’s cover art. Since then, that has been removed and a much smaller version of the cover appears left of the song info in the top toolbar. While this is merely a cosmetic issue, and nothing to get too upset over, nonetheless it was pretty cool seeing a nice-sized picture of the cover appear at the bottom of the left pane. But fret not, as there is a way to get this back, via the Cover art display plugin for Rhythmbox. And while it currently isn’t in the software repos for Raring Ringtail 13.04, I’ll show you how to get around that too, and install it easily. … then copy the line that should be at the top of the file deb http://ppa.launchpad.net/fossfreedom/rhythmbox-plugins/ubuntu raring main and paste it at the bottom of the file, then replace “raring” with “quantal“. Once you’ve saved and closed the file, the sources list for plugins will specify to look for both 13.04 (Raring Ringtail) and 12.10 (Quantal Quetzal) versions, and when you sudo apt-get update again, all the available plugins will be listed in your package manager. You can then install this plugin and others via Ubuntu Software Center or Synaptic Package Manager, or just run the install command again (sudo apt-get install rhythmbox-plugin-artdisplay). Once it’s installed, all you have to do is enable it. Go to Edit > Plugins and enable the Cover art display plugin. 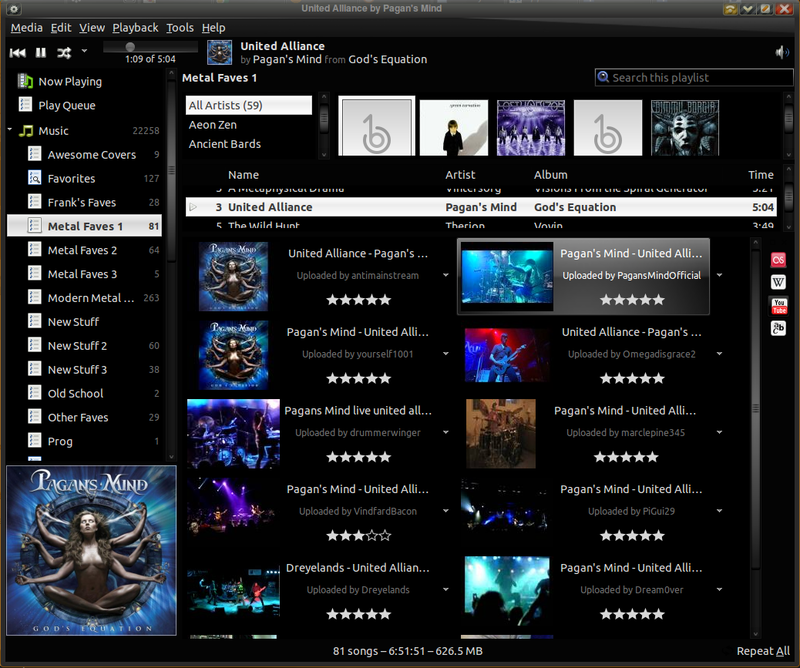 Your cover art should now be in the left pane, with the smaller one still in the toolbar near the song title. If for some reason you don’t want the smaller cover in the toolbar any more (I say have both, but that’s up to your tastes), you can disable that by going to the View menu and un-checking Album Art. Note: If you’re reading this in Ubuntu 13.10 or above, and there is no current version after adding the PPA, edit the sources file accordingly, meaning substitute the word relating to your current version with that of the previous one. In other words, in Raring Ringtail 13.04 we had to replace “raring” with “quantal” for Quantal Quetzal 12.10, in Saucy Salamander 13.10 you would replace “saucy” with “raring“, and so forth (and if all fails, just replace that with “quantal“, which definitely has a version of the plugin). Besides moving to the Unity interface, one of Ubuntu‘s other big moves in 11.04 Natty Narwhal will be the replacement of the default music player, Rhythmbox, with another popular media player, Banshee. This is actually because the Rhythmbox development team has announced that while they might push out one more version, it’s the end of the road for this popular music player (PLEASE NOTE: This situation only lasted a couple of Ubuntu versions, and Rhythmbox is again being developed, and is once again the default music player). We’ll have a general look around the new default player, as well as cover everything you’ll need to know if migrating from Rhythmbox. Those upgrading won’t have to worry about Rhythmbox being uninstalled, and any installing a new system can always install Rhythmbox as well, and even uninstall Banshee if so desired. But Banshee is a worthy successor, and is very much like Rhythmbox anyway, just with more bells and whistles. Not just that, if you’re planning on trying it out on your current system, it can import all your Rhythmbox playlists to make the transition less painful. 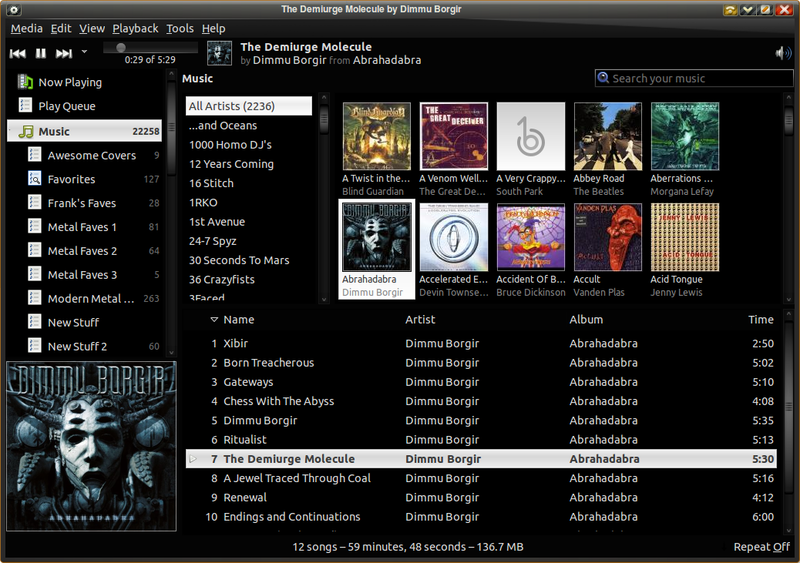 At first glance, Banshee is almost identical to Rhythmbox, except that it displays album covers in the browser. 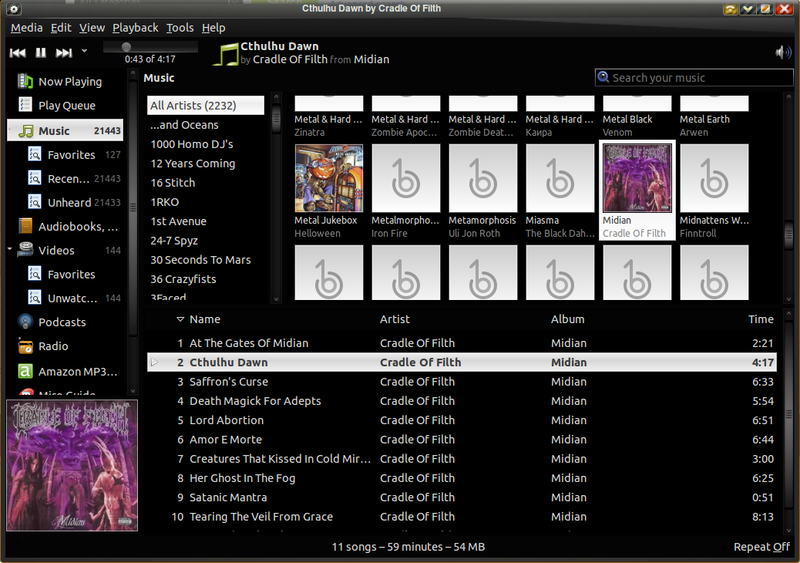 But besides having all of the features of Rhythmbox and some of its plugins, Banshee is a full media player, able to play video as well as all sorts of audio. Setting it up is easy, as it will automatically scan your ~/Music folder’s contents (you can of course change it to wherever you store your music via Banshee‘s preferences; whenever you want to force a scan, go to Tools > Rescan Music Library). You can then import your Rhythmbox playlists via Media > Import Media… (if you also have Rhythmbox installed); the Import Playlist… option you’ll also see is for importing individual playlists you may have saved, which would be the case if you’re migrating settings into a fresh install. When you import your Rhythmbox playlists, you might find the tracks listed in alphabetical order (by band), instead of the order you previously had. Just click above the track names (on “Name“) and it will cycle through different methods of arrangement, including the original setup you had saved in Rhythmbox. Actually, you can do it with “Artist” and “Album” as well, with it arranging tracks alphanumerically by artist or album, then the reverse order, followed by the original custom layout. Your Rhythmbox covers may be something else you wish to import. For many, it won’t matter at all, as the covers Banshee fetches are quite adequate. But if you find some of your old covers are better, or you went to some effort to find better covers than Rhythmbox offered (or couldn’t find at all), and don’t want to waste those, you will find all your covers in /home/yourusername/.cache/rhythmbox/covers. (Note that the period (.) before “cache” denotes it is a hidden folder, so you will need to enable viewing of hidden files and folders if you haven’t already done so). Simply locate the desired cover – which is easy, since they are named in alphanumerical order by band, followed by album title – and drag it on the cover you see in the bottom-left while a song is playing. If you don’t see a cover, you’ll just have to go to View > Show Cover Art to enable it (currently the default is to have it off, but I imagine that will soon change). You’ll probably want to know where your covers will be from now on, so the location is nearby at /home/yourusername/.cache/media-art. Note that your covers will no longer be listed in the logical order you’re used to. While there currently doesn’t seem to be a way to import Rhythmbox‘s album art easily, you might find many are better than what Rhythmbox found anyway, so you’ll probably only need to replace a few covers, notably those Banshee can’t find either. Also, if your music folders contain cover art with names like cover.jpg, then Banshee will probably use those instead of looking for them. When Banshee can’t find a cover for you, or you just want a better one than the one that’s offered, simply search online, save the picture, then drag it onto the cover in Banshee‘s bottom-left, and it will save a copy in its art folder. Banshee might at first glance seem devoid of a shuffle button for mixing up the order of tracks played, but it actually has a much better one than what you’re used to in Rhythmbox. In fact, you can look at it more as a shuffle menu, as you can not only enable it, but chose the method of shuffling. All you need to do is click the little down-arrow at the end of the Next button, and a menu will drop down. From there, pick anything other than Shuffle Off. You will notice the Next button is now a Shuffle button (actually, it’s a Next button that shuffles), and you can choose to shuffle by song, artist, album, rating and score via the menu. As you can see with the seemingly hidden shuffle button, all you need to do is look around a bit, and you’ll soon find your way around. If you’re migrating from Rhythmbox, some things might be named different, and found in different menus than you’re used to, but you’ll get there. Banshee will probably surprise you with a few cool features, and you should find you can do everything you did in Rhythmbox. If there’s still something missing in comparison, then it was probably a Rhythmbox extension that gave it to you, and you’ll probably be able to find the same as an add-on for Banshee. To install additional features, you can just search for “banshee” in Synaptic. You’ll be presented with a bunch of extensions, including support for visualisations (banshee-extension-openvp), an alarm with variable volumes (banshee-extension-alarm), a radio stream recorder (banshee-extension-streamrecorder), support for displaying lyrics (banshee-extension-lyrics), and much more. There is even a plugin that changes your desktop wallpaper to the album art of the currently playing track (banshee-extension-coverwallpaper). One cool feature of Banshee is the Context Pane, which basically adds a section at the bottom that lets you view other data, like lyrics, YouTube videos, and even the Wikipedia page! You can be forgiven for thinking it is overkill, but it actually comes in handy, though you might not want it visible the whole time. Obviously it will show you lyrics (if it finds them, though it looks to more sources than Rhythmbox, which is a pleasant surprise), but the Wikipedia option is actually quite neat, as it will automatically look up the band currently playing. The initial viewing area isn’t that huge, and can’t be customised by dragging any borders (more on that in a second), but most of the time, this will do fine for a quick bit of info. The YouTube plugin is another that is a great feature, yet also appears limited in its appeal due to the size, however the pane can actually be expanded via a hidden button. In the seemingly blank area above the plugin icons/buttons on the right side of the context pane, if you hover your mouse cursor there, you will see a small button appear with the tooltip “Make the context pane larger or smaller“. Use that toggle button to enlarge the context pane, and shrink it back again. When you find a clip you want to play, click it to play it in the context pane, or click the down-arrow to the right of it and choose either to “Play in Banshee…” or “Play in Web Browser…“. Now, there is one more way to expand your viewing area, which makes playing it in Banshee even more valid an option, and that is by selecting “Now Playing” in the top-left, instead of “Music” or one of your playlists. The context pane will then take up the bulk of Banshee. And you can then go one better by clicking the Simplify button that will now be present above the context pane. This will hide the menu bar, as well as the left-hand pane. Click the button again to toggle back to the previous made. (At the time of writing, playing YouTube clips inside Banshee doesn’t seem to work, so unfortunately I can’t illustrate what that would look like, but the size seems adequate, and for now at least the option to play the selected vid in a web browser works). To hide the context pane, next to that little hidden toggle button you’ll find another that will “Hide context pane“. To show the Context Pane again, simply go to the View menu and click Context Pane. You might not be impressed, especially if you just want a music player, but you have to admit it will catch on with those used to doing it all (ie: looking up info and YouTube vids while playing music) in the one place, namely their smart phone. And don’t forget to keep an eye out for extensions for the context pane, as there are already a couple out there, and soon there should be a whole heap to choose from. (Note: to enable or disable any plugins, go to Edit > Preferences, and in the Extensions tab scroll down to Context Pane and either tick or untick the desired add-on). 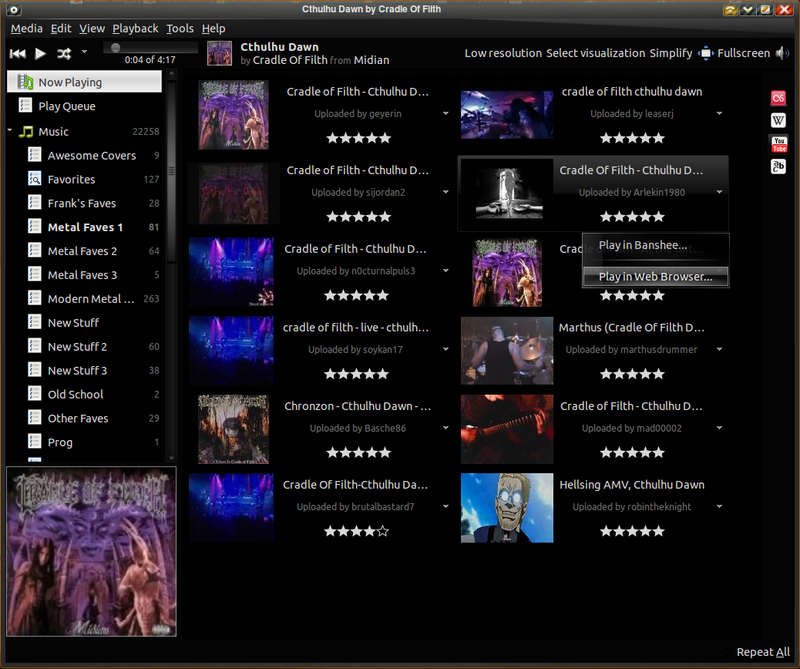 As you can see, Banshee is quite a full-featured media player, and will be even more so as more extensions are developed. And if you’re making the move from Rhythmbox, the transition should be a lot easier than you imagined. If you like the email notification aspect of the Indicator Applet, but want to get rid of the volume button that by default rests to the left of it – especially if you plan to restore the original Ubuntu volume button – don’t worry, as it’s quite easy. When the panel reloads, the volume indicator will be gone. Accessing internet radio (or eRadio) stations in Ubuntu is pretty simple. Most of the media players installed by default in Ubuntu can handle the task, and you can easily find and install many other great apps (like Amarok) via Synaptic Package Manager. The current default for this is “Movie Player” (actually called Totem), and it does the job well, but there is another app installed in every system that can do even better: the default “Music Player“, Rhythmbox. What we’ll look at is the basics of eRadio in Ubuntu (using the default Totem Movie Player), how to set up a web radio station in Rhythmbox, and why it’s a good idea to do so. Finding web stations to your liking is a simple matter of a few minutes in Google, and when you find some you’d like to listen to, they generally have a clearly visible link to click. When you click the stream link, Firefox will ask what you want to do with it, so just go with the default of opening it in Totem (or “Movie Player” as it will be listed). Totem will open, and the station will be visible in the Playlist pane. You might even find it lets you access more than one station, as some will have US (English) and European (often German) versions. Simply double-click the station name and it will start streaming music within a second or two. Now, while Totem does the job, and all that was pretty quick and painless, there isn’t a way to bookmark the station or anything, and from the lack of any additional information you wouldn’t even be aware many stations broadcast the artist and song names along with the music data. This is why setting up stations in Rhythmbox is a great idea, but you’ll still probably need the help of Totem to do so. As you probably know, when Firefox wants to know what to do with a specific file, you can actually choose a program other than the suggested default. Usually, a list of apps will even be presented to you, but in the case of links that point to a .pls (“MP3 ShoutCast playlist“) file, you probably won’t find a way to open it in Rhythmbox. That’s because (currently) no apps at all are suggested for that filetype, and manually specifying the command /usr/bin/rhythmbox may not help. Same goes for other formats, like .wax (“Windows Media Audio Redirector“) files (more on those at the end of this article), but there is a simple way to get around this. Now, when you click a link that points to a playlist file, the URL will be something like http://www.heavymetalradio.com/listen.pls, and (currently) Rhythmbox seems incapable of handling that (which is why nothing happens). But if you open the station in Totem, you can right-click the station and choose Copy Location, and you’ll find the URL is something like http://www.heavymetalradio.com:8000 (the numbers on the end are the port to connect to). Once you’ve pasted in the address and clicked Add, you will see your station(s) in the right-pane. Once again, just double-click the desired station to begin streaming, which you can of course pause at any time, and it will begin streaming again when you click Play. Now you will notice that not only do you have the name of the station in the title bar, but also the name of the artist and song currently playing. That information is also visible beneath the media control buttons. It doesn’t end there, as you can do one more thing, and that is customise the “cover” artwork. You’ve probably noticed when accidentally hovering your mouse over the artwork area that a tooltip saying “Drop artwork here” appears, and this is what we’ll do for the radio station (so pick a picture you like, or download their logo). The option for album cover artwork is actually supplied by a Rhythmbox plugin, which should be installed by default; if it isn’t, you should be able to get it easy enough in Synaptic by searching for “rhythmbox“. 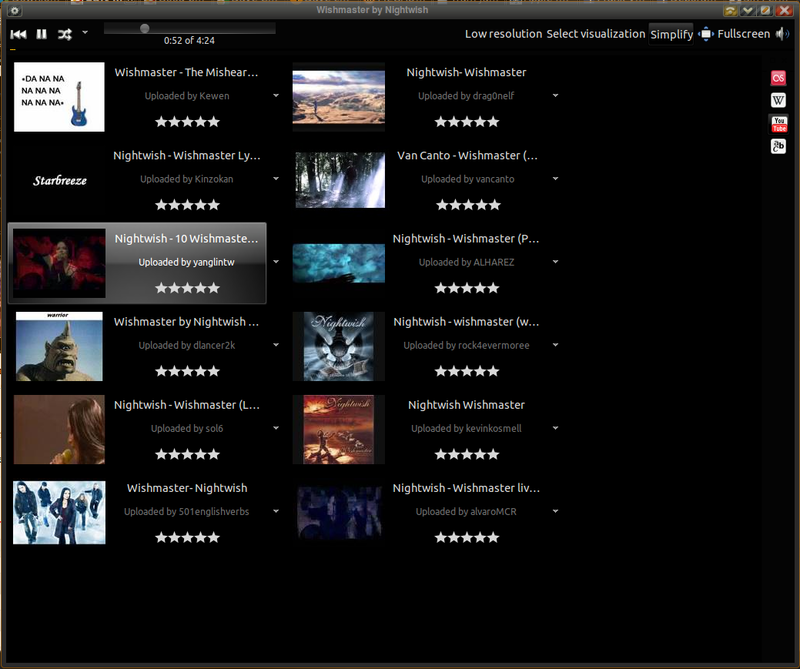 If you don’t have artwork visible, it is still probably installed, just not enabled, so go to Edit > Plugins and enable Cover art. Then simply drag a picture file from an open folder window onto that area, and it will be displayed every time you activate that station. As you can see, that’s all pretty easy to do, only takes a few minutes, and is well worth it if you want to access your favourite internet radio stations in a flash (not to mention have the current track info broadcast along with the music). When you go to open a station via a .wax file in Firefox, it should go to open as expected in Movie Player. Once again, all you need to do is copy the URL in Totem, create a new station in Rhythmbox, and paste in the address. But you may find that the name of the station doesn’t automatically appear, but is instead just the URL. But that’s only a minor issue, as all you have to do is right-click the station and choose Properties to edit its information. Simply replace the URL (or whatever text you want to replace) next to Title: and click Close. Your new station will now have the proper name, or any that you desire.